ActBlue gives your team the ability to process refunds or cancel recurring contributions, ensuring that you can handle simple donor relations issues right away. Keep reading for everything you need to issue refunds to donors and cancel recurring contributions. And as always, if you have questions our team is always here to help at support@actblue.com. If a donor requests a refund, you can track down their specific contribution by using the Search function in your Dashboard. Once there, fill in any available information about the refund, and click Search. If the contribution has already been disbursed in a check to your team, you’ll see a message prompting you to contact our customer service team. If the contribution has already been refunded, you’ll see the date it was refunded, along with the reason (if entered at the time of the refund). You can also click the date to see who processed the refund. If a donor has signed up for an unintended recurring contribution or would like to cancel their recurring contribution, you can take care of that, too. Click on the order number for the contribution. Then, just click “Cancel the remainder of this recurring contribution” at the bottom of the screen. 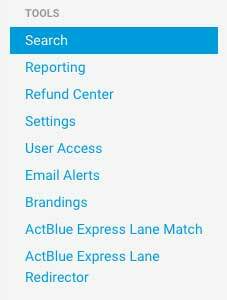 Your refund center lists all refunds made from your ActBlue account -- whether they were processed by your team, ActBlue Customer Service (in response to a donor call/email), or credit card chargebacks. To access your refund center, just select it from the sidebar of your Dashboard. There are two types of refunds, and the type of refund may affect whether you need to report the contribution. The first is a pre-disbursement refund, which is issued before the funds are sent to your committee. This may not need to be reported, since your campaign or organization never received the funds. You’ll be able to tell which are pre-disbursement refunds because they’ll have an N/A in the “Disbursed” column. The second type of refund is a post-disbursement refund. This is a refund issued for a contribution that was already sent to your committee, and it may need to be reported by your campaign or organization. 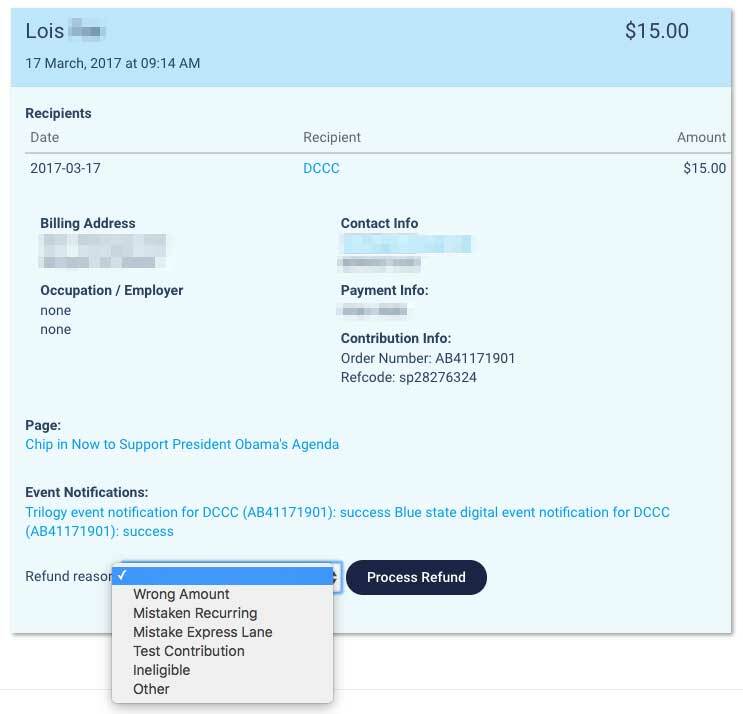 You can click on the date listed under the “Disbursed” column to see information about the check that originally contained the refunded contribution. If a donor requests a refund after it’s been disbursed, we’ll deduct those funds from your pending check. Once you’ve received enough money to cover the refunded contribution, you can click the date under “Recovered” to see information about the check from which the refund has been subtracted. Our customer service team is always happy to answer any questions, as well as locate and handle any refunds or recurring cancellations for you. Just send us an email at support@actblue.com and we’ll take care of it right away!